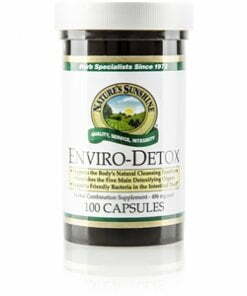 Nature’s Sunshine Enviro-Detox combines fourteen key nutrients that aid in the body’s cleansing processes. 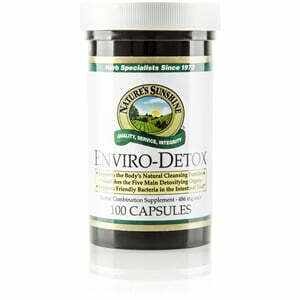 Enviro-Detox also supports the organs that work to detoxify the body: the liver, lungs, bowels, kidneys, and skin. Several of the herbs in this formula assist the liver in purifying the blood, others promote the health of the immune system which fights harmful substances in the body, while others aid in the digestive process to rid the body of toxins. Together, the herbs in Enviro-Detox provide a powerful source of nutrients for the body to protect itself. Instructions: Take one capsule with a meal three times daily. Drink one glass (8 ounces) of Nature’s Spring water with the capsules. For best results use with Homeopathic Detox.